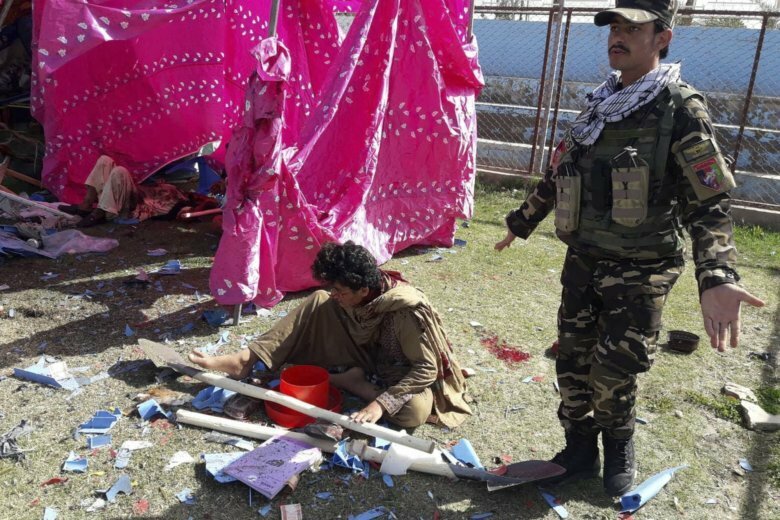 Omar Zwak, spokesman for the governor of Helmand province, said the bombings targeted a celebration of Farmer’s Day in a sports stadium in the provincial capital, Lashkar Gah. Elsewhere in Afghanistan, gunmen shot and killed Obaidullah Barekzai, a former lawmaker, in the southern Kandahar province, according to the provincial police chief. Gen. Tadeen Khan said the gunmen opened fire on Barekzai’s vehicle on Saturday in Kandahar city. No one immediately claimed the attack. In the northern Kunduz province, dozens of people protested against a military operation while carrying the remains of their loved ones. Photos from the protest showed what appeared to be the bodies of 12 people, including five or six small children. “We are investigating if any civilians were killed or wounded,” he said.